joyfully ruined: meeting the boys in congo. meeting the boys in congo. 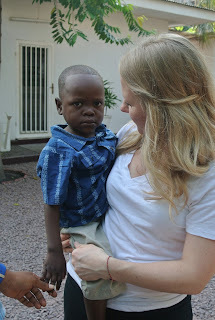 on january 27 todd & boarded a plane bound for congo. in my mind i have written this post, but what i thought i would journal is completely different than how it is going to turn out. debated writing a day by day blow of our journey. or maybe only the good. but then i realized that i needed to be as open as i have been in the past. so as we boarded our plane in salt lake city, we embarked on a 30+ hour journey to our sons. along the way we met some amazing friends who would get me through the hardest week of my life. each and everyone of them played a vital role in week. i am better for having known them. i want to share with you the lessons that God has taught me through my beautiful time in Congo... but those are going to have to come a little later. because there are so many. but here is our first meetings with our boys. all in a small sedan. these kiddos literally poured out of the car. running to the first person that they are able to see. grasping for comfort. clinging with dear life to someone that adores them. but someone that they have no clue how to relate too, how to communicate with, or how to trust. i can assure you that it was a moment i will NEVER forget. it was one of the most precious moments of my life. driven by an emotion that truly came the moment i first saw their sweet faces. titus clung onto me with dear life. his awkward grip around my neck and under my arm. grabbing levi through the crowd of moms & dads, kids & nannies... i couldn't believe that i finally had the boys in my arms. after months & months of staring at pictures... i was looking into their fear stricken faces. i finally had my boys. and the adventure to crazy begun. i'll post about our crazy week later. seriously it would make you want to crawl into a whole and cry for me. i mean it. it was simply the hardest thing i have ever done in my life. & God carried me moment by moment. Wonderful to see that you have your family all together now! Can't wait to hear more about your time in Congo.